I'm teaching a series of Native American art history courses at Arizona State University this year, and it's has been fun getting to know the students (the majority of whom are non-Native artists). I think we're finally at the point in the semester where we 'get' each other. They are bright, and although most of them know very little about Native American cultures or art, they've taken up the material with interest and are doing a really good job (so far, haha). Because I'm back in 'Teaching Mode,' I'll be doing more 'Some History' posts. Right now, we're looking at the Southwest region in two of my classes, so I wanted to share these images of Ancestral Pueblo jewelry. To the left is an Ancestral Pueblo (also known as Anasazi, which means Enemy Ancestors in Navajo) stone figurine found at Pueblo Bonito in Chaco Canyon. 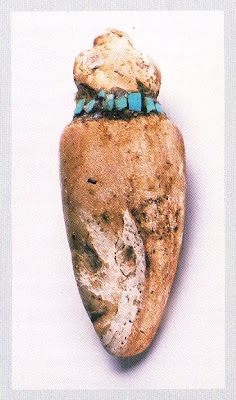 The figurine, which estimated to have been made sometime between the years 1040 and 1120 CE, is wearing turquoise a turquoise necklace. 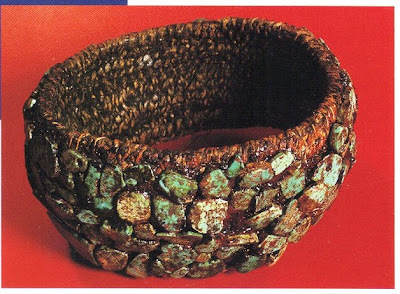 This ancient basketry bracelet is encrusted with turquoise plaques that were set using pine-pitch adhesive. Found in Texas, this bracelet is thought to have been made around the year 800 or later. This is a picture of Ancestral Puebloan turquoise, spiny-oyster shell, and jet beads and pendants found at Pueblo Bonito in Chaco Canyon. The shell and jet necklace contains more than five thousand beads that range in size from 1-2mm. Just to give you a sense of size, the frog is about 3 inches long. These items are dated to around 1000-1200 CE. This Ancestral Pueblo obsidian blade-shaped gorget is overlaid with a mosaic of turquoise, shell, and jet. Found in a seed jar in Utah, it also dates from around 1000-1200 CE. These three earring sets demonstrate how the style of Southwest mosaic-inlay work has remained constant from the ancient pre-Puebloans to contemporary artists. 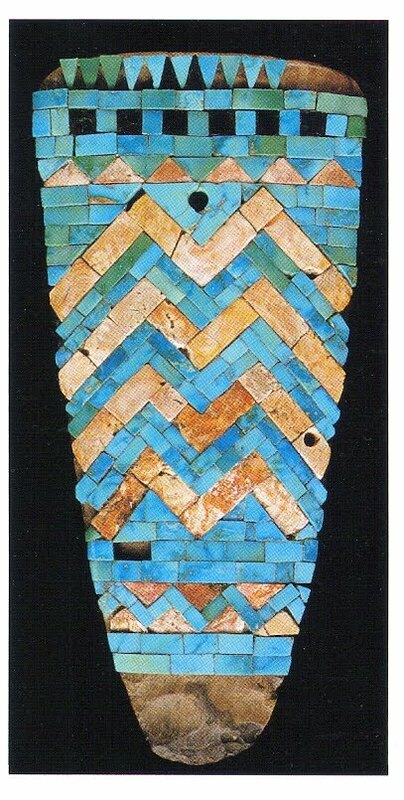 (Top:) These Ancestral Pueblo turquoise-mosaic pendants are estimated to have been made sometime between 1100-1200 CE and were found at Canyon de Chelly. (Middle:) These Hopi turquoise and abalone shell earrings were made in the late 1800s. 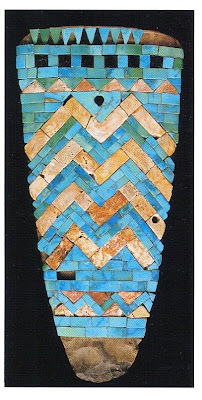 The mosaic includes turquoise beads found at ancient ruins. (Bottom:) These earrings of turquoise and abalone shell were made by Hopi master jeweler Charles Loloma in 1978. 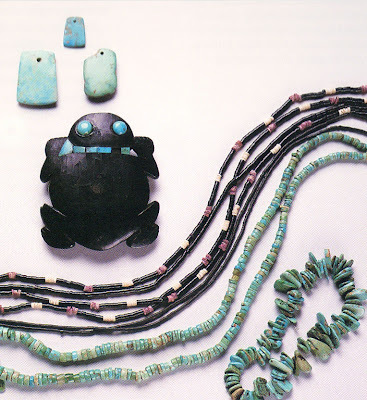 This is a photo of Hoo-n-ym-pka (Hopi), who wears turquoise mosaic earrings and a necklace of glass seed beads strung with one larger bead, seen on the left. 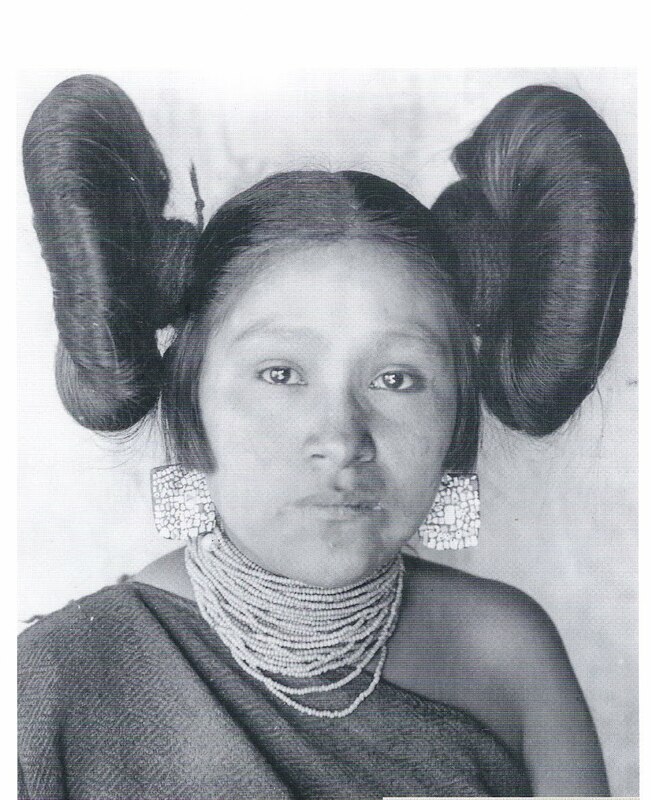 Her butterfly hairstyle is typical of postpubescent, unmarried Hopi women. Her manta is the traditional black woolen blanket dress worn by Pueblo women. This picture was taken in 1901. To learn more, check out this book (where I found these images): North American Indian Jewelry and Adornment.